I recently finished making Quiet Book Number 4. Can you believe it. How have I agreed to make so many Quiet Books. I've done it so many times because I make them for people I love. This one is no different. I made it for three little monsters that I like to call my nephews. 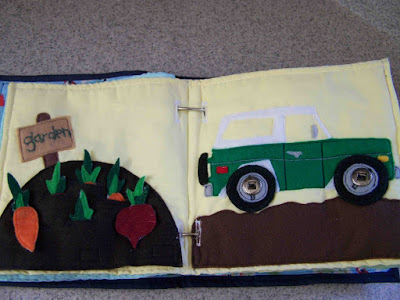 I know that I've posted similar images from previous quiet books before (see side bar), but I thought that it would be fun to take you on a tour of my recent quiet book creation. The cover is pretty basic. I did another monogram on the front. 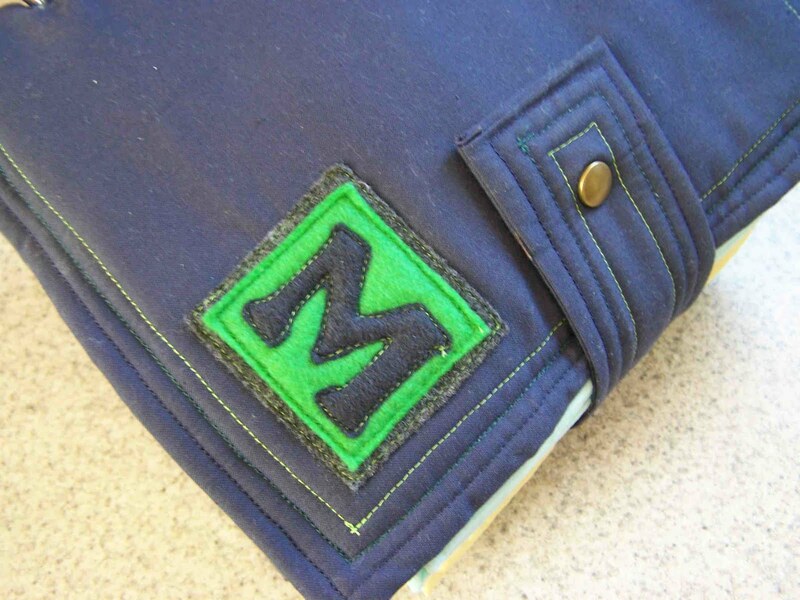 I played with the idea of doing some monster appliques on the front, but in the end I liked the simple monogram best. 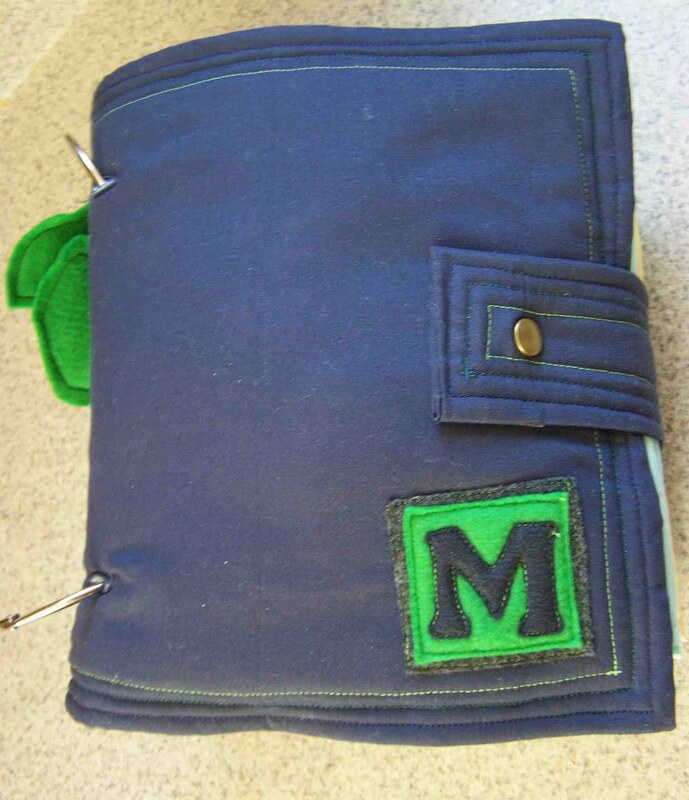 One change I made to this quiet book is that I used a snap closure in place of velcro. 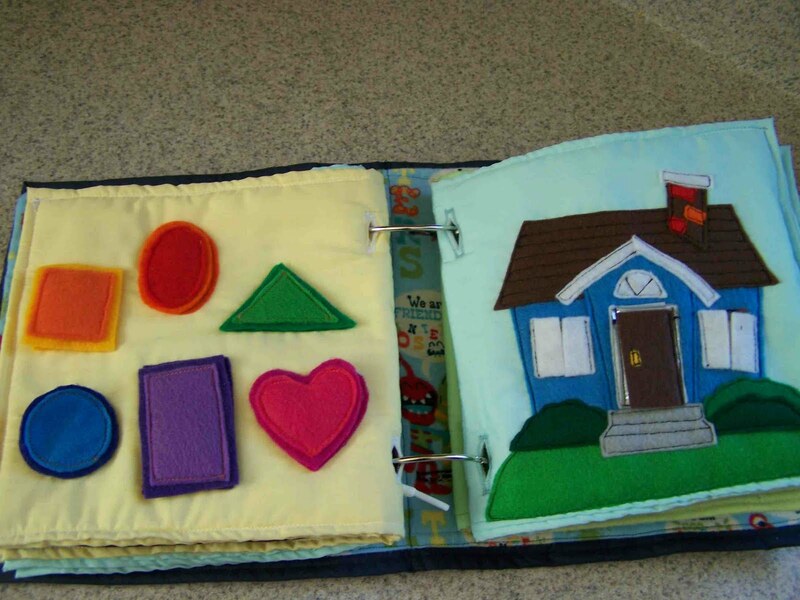 I didn't have any snapping pages in the book and figured that it would be a good thing for little hands to learn to do. As you can see on the left I used some monster themed flannel as my "end paper". It was pretty cute and I figured that most little boys like monsters. Here's a view of the clock page. There are some slight variations with the shape of the clock's hands, and the type of button that I used. I love the shoe lacing page, but it is SO much work. 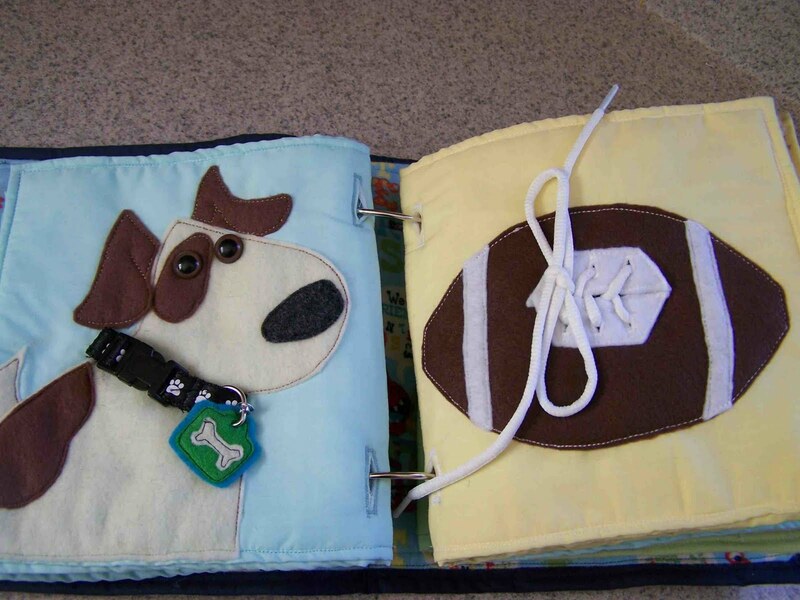 I decided to go with a football lacing page this time. There is another dog collar page, which I think turned out pretty cute. I found the cat collar at Target in their $1 bins, a pretty good deal. This page may look unimpressive, but I was pretty pleased with it. 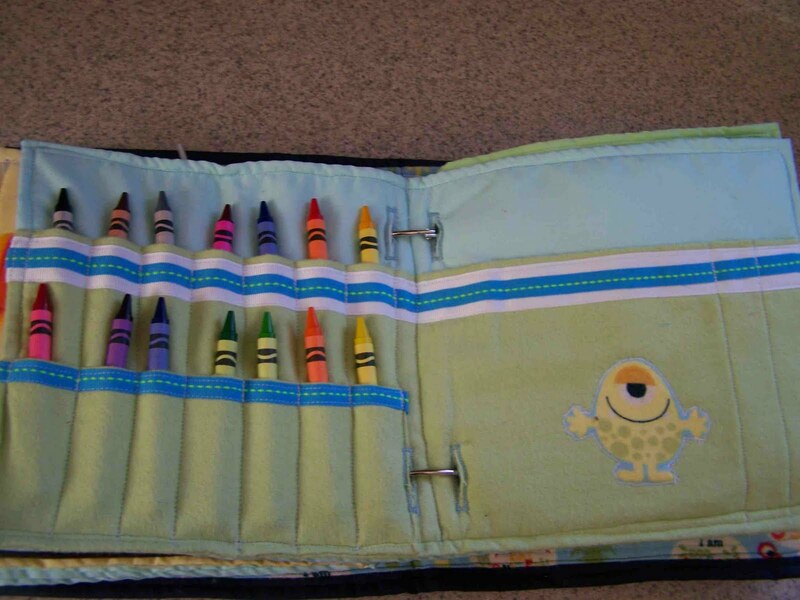 I made a double decker crayon caddy to accommodate more crayons. The top row of slots are actually full length. I did this in the case that my Sister-In-Law wanted prefers the longer twistable crayons. There are a few empty pockets on the right that need to be filled with a note pad and pencils. This may be my favorite set of pages. I am still a big fan of the garden page. It is so fun for the little kids to help pull up the vegetables. The Bronco on the right is a personal favorite as well. Normally I make a truck for this wheel changing/button page, but for a personal touch I made a green Bronco just like the one that my dad had growing up (and that my older brother had intended on inheriting). My older nephew knows all about the green bronco. I love the mailbox page. My brother and his wife gave my nephews great names, but unfortunately for me they are longer than I am used to. I had to find room for 7 letters. Baby cakes number 3 is on the way, and it would be awful nice if they would name him something that is 7 letters or less and uses the letters N, A, T, H, P, R, E, S, A, N, and O. I don't know maybe Thor. Thor is a nice name right? 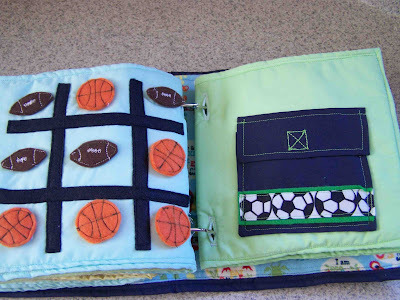 Another Tic-Tac-Toe page with balls. Footballs and basketballs this time. I decided that the balls needed their own pocket. My brother loves soccer so I added some ribbon. There was no way that I was going to piece together 6 soccer balls. 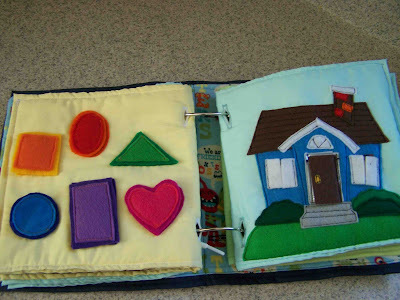 Simple shape matching page and a house with family photos. 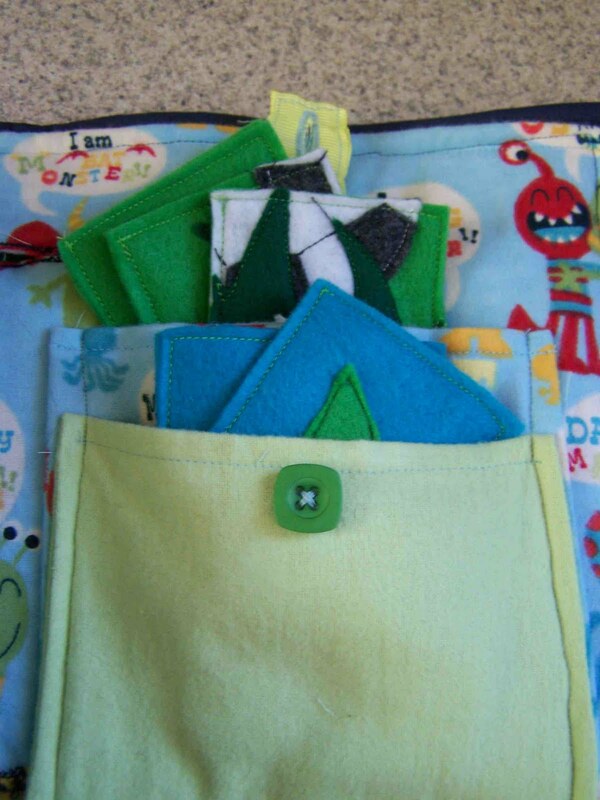 Four piece puzzle with stacked pocket storage. I love the pocket. There are three different puzzles, but I figured that one puzzle could stay on the board. 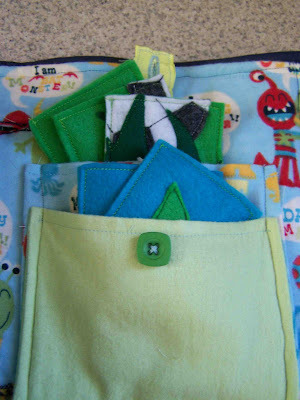 The stacked pocket allows the puzzle pieces to be separated without taking up too much space. What are the puzzles? An apple, sunshine, and a soccer ball. 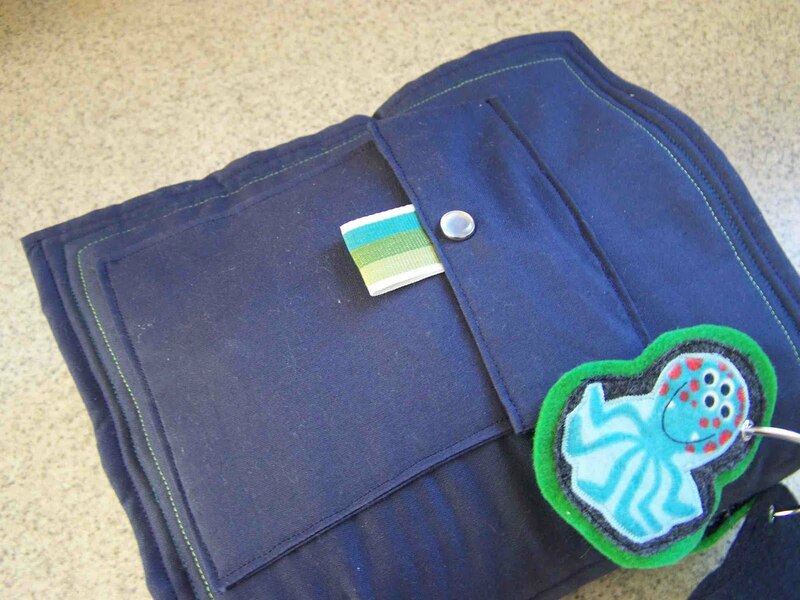 Here's a view of the back pocket. Isn't it cute? Okay it is pretty basic, but very necessary. It stores all of the extra letters for spelling monster number 1's name. I made three little hang tags to sit on the ring of the book. One for each little monster that will be using it. Aren't they cute? 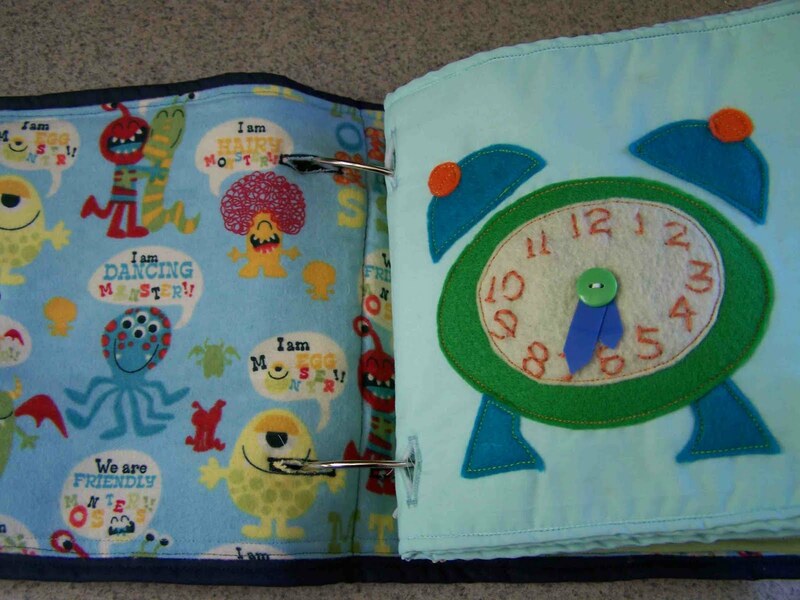 For more information on individual quiet book pages see the links on the side bar. 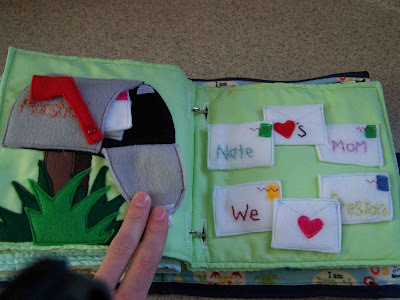 If you decide to make your own quiet book and have questions just let me know. I'd be happy to help. Thank you to everyone who leaves such kind comments on my posts. I really appreciate your nice words. They keep me crafting. Check out these great link parties that I'm participating in today. it's fantastic. I love the dog page and the car page for buttons. I'm planning on starting a quiet book soon and have been saving sites to get ideas. I love this one. This is absolutely, utterly, truly awesome!!!!!!! Oh my gosh. This is amazing! Do you sell these? I would love to have one for my son Blaze. I have a sewing machine and all that but not sure I have the talent to make on myself. Is it beginner friendly? So much work, Tricia, but the final product is so worth it! It's just... so special and personalized. Beautiful stuff. Awesome creations, as always, Tricia! 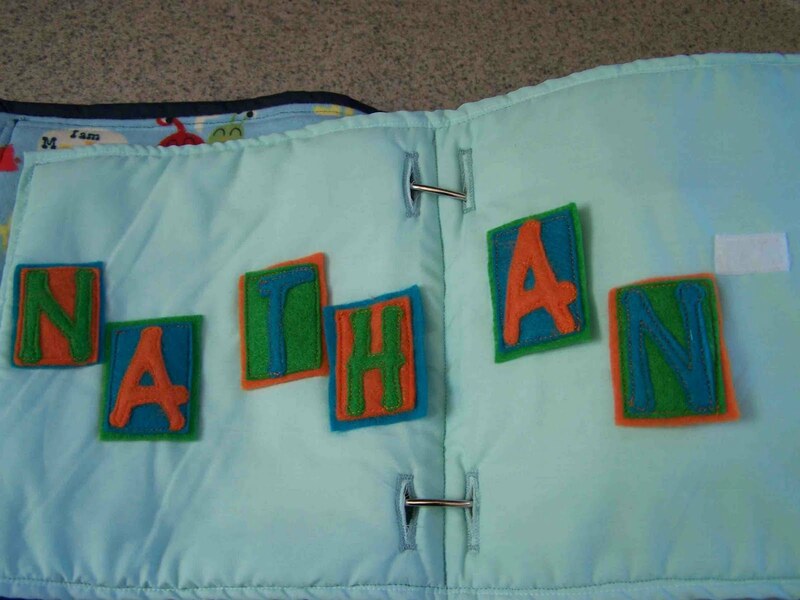 Quiet Books for sale: They are fun to make and personalize, but they do require a large amount of time and energy. They aren't extremely difficult and I think that any skill level could make one, but they do require some patience. Because they are time consuming I am not selling them (because I don't think that you'd want to pay what I'd have to charge in order to earn minimum wage). I'd be happy to offer any help or guidance to any of you who are contemplating making one (Shana and Kandi). If any of you still want me to make one for you, send me an email and tell me what you are willing to pay. I'll let you know if I accept or not :). I just found your blog and i just had to tell you that I love this! 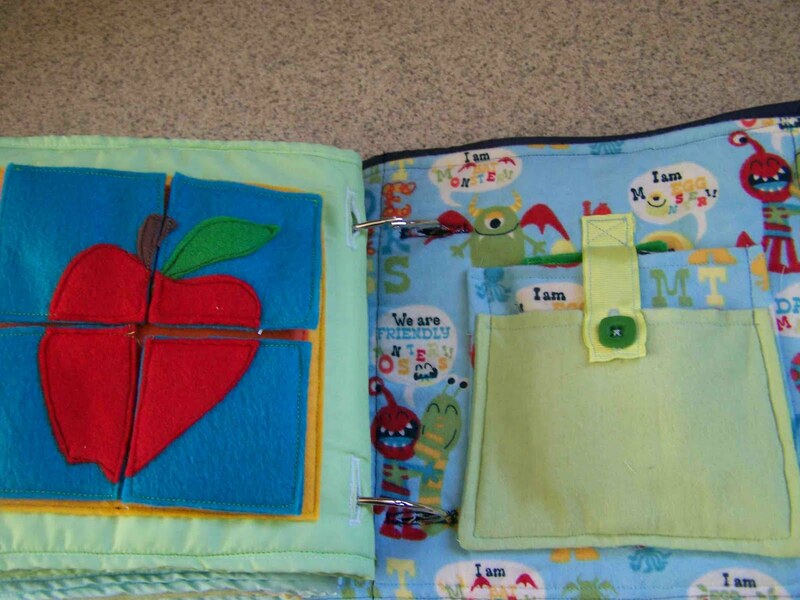 I just finished a quiet book for my daughter and have been feeling the urge to make another. You have so many great ideas and I love how you put it together! I will be definitely coming back here for more inspiration and help. I love this quiet book! So cute! The boys will love it! Oh Tricia! Thank you, thank you! The book is sooo wonderful! My little monsters WILL LOVE IT!You are so talented!Can't wait to see it in person! Hi! I just found your blog from looking at my google analytics page to see who has referred my site (Crafty Chic). I love your quiet book . . . so cute. I'm pregnant with a boy and appreciate seeing "boy" ideas! Glad to have found your cute blog! Wow! My mouth literally dropped open while scanning down this post! That is so cool! I L-O-V-E this! I'm visiting from It's So Very Cheri and I'm glad I did! This is adorable. You surely are a pro at this! My little boy isn't quite old enough for a quiet book yet, but I've been toying with the idea of starting now so it will be finished by the time he is old enough! Thanks for the inspiration. Visiting from So Very Cheri. This is so cool!! I can't believe this is your FOURTH quiet book!!! I hear they are very time consuming. I was hoping to make a couple of these for Christmas presents, but unless I get my act in gear...it won't happen! Thanks for shaing!! That...is ....darling! 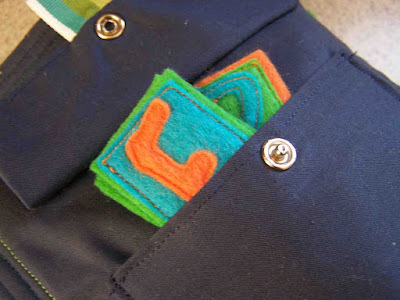 Such great ideas with felt and love seeing something cute and boyish. Keep it up! LOVE your quiet books! Thanks for the great inspiration. I'm actually in the middle of making some for my kids right now. LOVE LOVE LOVE! I've been making a quiet book for my boy for 7 months now and keep finding new ideas! Your book is adorable and now that I want about 5 or 6 of your pages in mine, I don't think I'll make my Christmas goal! Just found your blog and love so many of your quiet book pages. It's so nice to get so many new ideas for my girls' books! How did you attach the clock hands? And do they move? What an amazing Quiet Book. I made 2 books about 25 years ago for my little ones, now my daughter suggested I make one for her son. I love your blog and your willingness to share your ideas. Time to start making one so that it's ready for Christmas! Thanks! Thank you for sharing these! I am excited to attempt one of these. These would make awesome shower presents and birthday gifts! I can't wait to get started. What a wonderfull book, I'm so lucky found your blog. Also, I saw that you offered to make them. I have two girls (2 years and 6 months) and have been wanting to get a quiet book for #1 for at least a year but I am not extremely crafty. I'm happy to pay someone as talented as you to make one--- what's the process? is going to bug me to make one for her. Love it though. i really love that you personalized the book with the bronco and family photos in the house windows. kids really seem to appreciate the attention to detail in a way that sometimes adults forget. great work! Lol if they go for another Sarah & Ashton use those letters too. Love it though. Curious in how clock hands work? Oh I love this!!!! GREAT effort!